Armor of the Seven is a Legendary Titan Armor in Destiny. 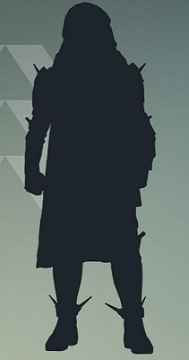 At the moment the armor remains unknown, possibly a future content Bungie will release as a dlc or event. The armor require the player to be Level 20. Each piece of armor comes with a bonus to Discipline, Strength or Intellect. These bonuses are random. Each piece of armor has Armor Upgrades and these are shown in the spoilers below the screenshots. This armor has TYPE 1 COATING - This Armor can be recolored using version 1 or newer micromaterial shaders. MOMENTUM TRANSFER - Causing damage with a grenade reduces your melee cooldown. PARAMUSCLE ARMATURE - Increases grenade throw distance. RAIN BLOWS - Increases melee attack speed. IMPACT INDUCTION - Causing damage with a melee attack reduces your grenade cooldown. UPGRADE DEFENSE - Increases this Armor's defense. INVERSE SHADOW - Increased Super energy from killing minions of the Darkness. INFUSION - Replenishs health every time you pick up an Orb of Light. INNERVATION - Reduces grenade cooldown each time you pick up an Orb of Light. INVIGORATION - melee cooldown each time you pick up an Orb of Light. AUTO RIFLE AMMO - Increases the amount of Auto Rifle ammunition you can carry. PULSE RIFLE AMMO - Increases the amount of Pulse Rifle ammunition you can carry. SCOUT RIFLE AMMO - Increases the amount of Scout Rifle ammunition you can carry. HAND CANNON AMMO - Increases the amount of Hand Cannon ammunition you can carry. SHOTGUN AMMO - Increases the amount of Shotgun ammunition you can carry. FUSION RIFLE AMMO - Increases the amount of Fusion Rifle ammunition you can carry. SNIPER RIFLE AMMO -Increases the amount of Sniper Rifle ammunition you can carry. AUTO RIFLE LOADER - Increases the reload speed of Auto Rifles. HAND CANNON LOADER - Increases the reload speed of Hand Cannons. PULSE RIFLE LOADER - Increases the reload speed of Pulse Rifles. SCOUT RIFLE LOADER - Increases the reload speed of Scout Rifles.